If you haven’t heard of the Gili Islands, that’s not surprising as another one of their many charms is that they are a little off the beaten track. There are three Gili Islands, (Gili Air, Gili Meno, and Gili Trawangan), about 30 km due east of the big volcano on Bali’s North East tip, easily accessible via boats from Bali’s Padang Bai. There is plenty of accommodation on all three islands and dive centres covering all languages are dotted around each one. Each island is about a mile across and separated by from its neighbour by channels where water from the West Pacific runs down to the Indian Ocean. This moving water keeps things clear and the vis is usually excellent; plus it also brings nutrients from deeper regions up into the surface waters and over the existing reefs. Though the Gilis suffered their fair share of dynamite fishing they have been in repair mode for quite a while since those times. 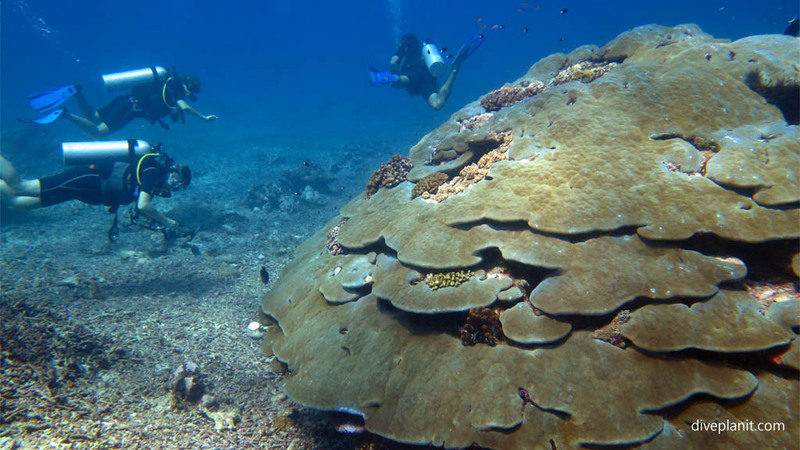 Many natural reefs, Secret Reef for example, survived that period completely unscathed, and are in pristine condition. In other places large artificial reefs have been created from stacks of concrete slabs. It’s particularly here where the turtles like to come and wedge themselves in for a snooze, unperturbed by the excited divers milling around them, trying to frame a decent shot. 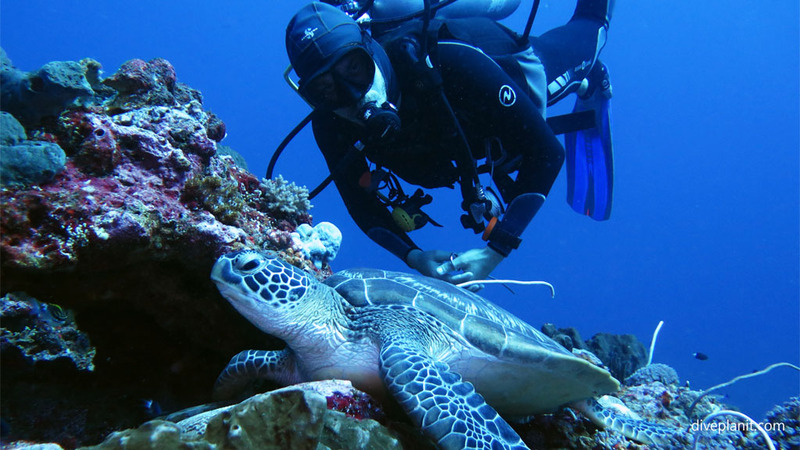 A number of the dive resorts also have their own house reefs, which are combinations of natural shallow reefs and often a few exotic items – like statues – added to make an intriguing underwater trail for both day and night diving. 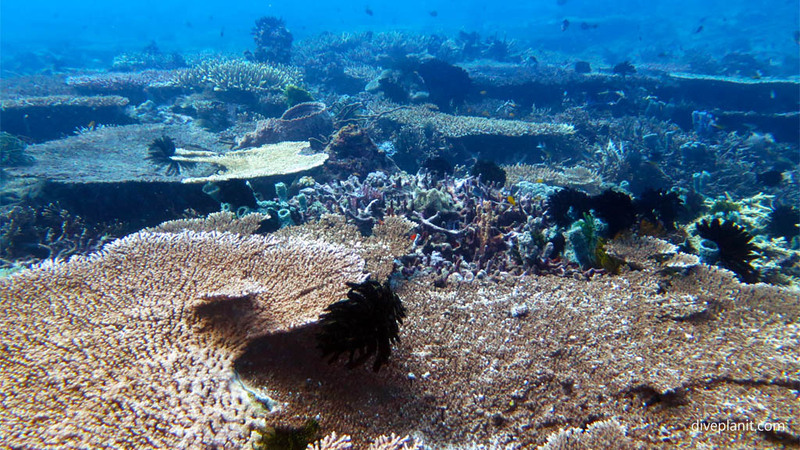 Check out the house reef at 7Seas Dive Gili, on Gili Air. This also makes the Gilis a great place to learn to dive, as you can do all the skills training in the shallows just off the beach. You’ll see over 30 different dive ‘sites’ listed on many dive centre maps – though many sites are not consigned to one area due to those ever present currents. Quite often you’ll start in one place on a wall (like Meno Wall) or a reef, then go for a drift through the middle of the channel between two islands, and end up on another part of the reef, maybe even on a different island. If you like high-speed drifts make sure that Deep Turbo is on your itinerary! And though the waters run well between the islands, the surface waters are quite flat as the islands are essentially the caps of quite smooth, flattish domes, presenting nothing to upset that smooth, steady flow south. After your dive you can chillax and browse the FishID books to claim the critters that you spotted over a Bintang with your new best buddies. As there is no motorised transport on the islands, no one is on a timetable. It’s a great place to meet travellers from all over the world and hear their diving stories. If you liked this post, you might also like another: WHAT YOU NEED TO KNOW ABOUT DRIFT DIVING. Previous Previous post: What Can I do to Try to Avoid Getting DCI? Next Next post: What does ‘ appropriate ’ first aid mean for diving injuries?